The new provider of the government’s controversial “fitness for work” tests has faced a humiliating first week in its new job, after it emerged that the company had been forced by disabled activists into buying an embarrassingly-named website. More than 30 protests took place across England, Scotland and Wales on Monday (2 March) to mark the day that the US outsourcing giant Maximus took over the provision of work capability assessments (WCAs) from the much-criticised Atos Healthcare. Protesters have pointed to Maximus’s lengthy record of discrimination, incompetence and alleged fraud in the US, and say that the replacement of one “toxic” profit-seeking company with another will make no difference to those disabled people being assessed. One of the tactics in the nationwide protests – led by Disabled People Against Cuts (DPAC) – was a comic rebranding of Maximus as “Maximarse”, which saw the hashtag #Maximarse briefly trending on Twitter. But in a bizarre twist, DPAC activists were astonished the next day to discover that Maximus – in an apparent bid to prevent them setting up a spoof website – had itself bought the domain name www.maximarse.com. The purchase was made on 26 January by the company’s senior manager for investor relations and corporate communications, Christine Graham, who is based at the company’s US headquarters in Reston, Virginia. Maximus has yet to comment on the purchase of the website name, or say what it plans to do with the site. Organisers of Monday’s protests from DPAC had already pronounced the day a success, even before the news emerged of Maximus’s bizarre public relations blunder. In London, a crowd had protested outside Maximus’s London headquarters near St James’s Park, directly opposite the Ministry of Justice. 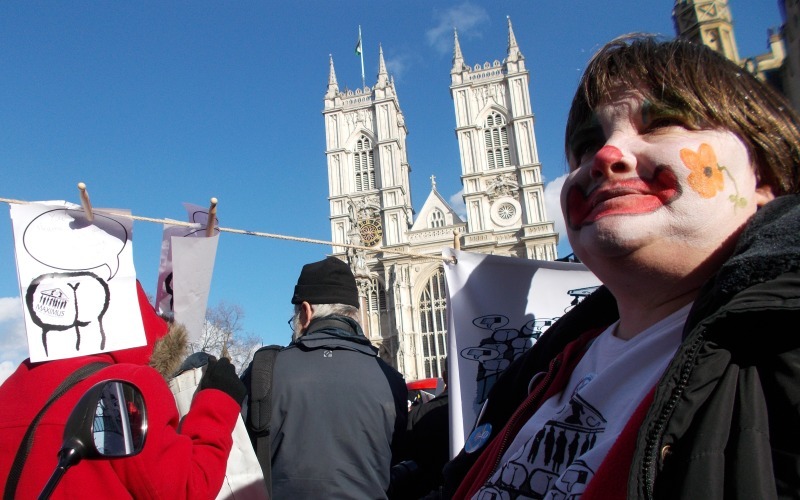 Some of the protesters wore clown make-up to highlight the day’s theme of “same circus, different clowns”. Protesters then blocked traffic by occupying a nearby roundabout, before moving their action a couple of hundred yards to Tothill Street, outside the headquarters of the Department for Work and Pensions. The final move was to nearby Victoria Street, where they blocked traffic near the Houses of Parliament. Andy Greene, a member of DPAC’s steering group, pledged that disabled people would make Maximus “as toxic a brand as we made Atos”. He said disabled people were being forced to deal with the fallout from the “double hammer blow” of poor policies and uncaring providers. Greene said that Maximus’s “mind set” was to “turn over a fast buck, and it doesn’t matter who gets turned over in the process”. Paula Peters (pictured), who played a key role in organising the nationwide protests, promised that it would be “the first of many actions”. The day of action was supported by fellow user-led groups Black Triangle, the Mental Health Resistance Network and New Approach, as well as the mainstream grassroots anti-cuts group UK Uncut. Other protests on Monday included actions outside Maximus assessment centres in Bradford, Brighton, Ealing, Edinburgh, Glasgow, Leicester, Lincoln, Manchester, Portsmouth, Reading, Sheffield, Stockton-on-Tees and Wrexham, and even in Toronto, Canada, where Maximus has a significant presence. One of the largest protests was in Norwich, where DPAC and the disabled people’s organisation Equal Lives again highlighted the absurdity of holding assessments in a building, St Mary’s House, which is inaccessible to wheelchair-users. Asked to comment on the nationwide protests, Lisa Miles, senior vice-president for corporate communications for Maximus, called on activists to “separate the work that we are doing from the policy that they are protesting”. When asked by Disability News Service whether the company was concerned that it might suffer the same damage to its brand that Atos had experienced, she said Maximus had “a plan in place to make improvements”, although this was “not going to be overnight”. This is set to include improved communication with claimants, resources to help claimants fill in forms, and a “significant” increase in the number of healthcare professionals, including many with experience in mental health and an understanding of fluctuating conditions. Miles added: “We understood, coming in to the programme, that it is very emotional and people have very strong emotions, but our primary goal is to improve the process that we are ultimately responsible for delivering. But she did say that she thought the protests were “a bit unfair on the first day of operations”. Miles also claimed again that Maximus had been given no targets by the government for the proportion of claimants it should find “fit for work”, but would instead be held accountable for the quality of its work and the number of assessments carried out. But she added: “There is nothing in the contract that ties us to a decision one way or another. “We are carrying out the assessments on behalf of the government. We are essentially carrying out a service, but ultimately they hold the role and responsibility for the determination of benefits.